Photographer Shawn Malone of Marquette, Mich., took this dazzling photo of the spectacular Oct. 24, 2011 northern lights display. Canadian skywatcher Colin Chatfield caught this view of a stunning aurora display over his home in Saskatoon, Saskatchewan on Oct. 24, 2011. Photographer Shawn Malone in Marquette, Mich., expected a good aurora light show, but was still surprised by the sheer brilliance of Monday night's northern light show. "[I] had taken a few pics, went back to the car to change lenses, and when I looked up the sky was on fire," Malone said. "To the north there was this huge curtain that sent beams overhead to a corona in which I had to turn to the south to photograph. That's when I noticed the reds and pinks starting to happen. From there the lights were every which direction. It was hands down the best northern lights I've seen since the great storm of November 2004." Space weather officials said the arrival of the solar particles Monday triggered a geomagnetic storm that amped up the aurora displays. The sun is currently in an active phase of its 11-year solar weather cycle. "Couple that with the fact that large parts of the U.S. had very clear skies, and you've got some beautiful sightings of the aurora across the northern tier of the U.S.," Space Weather Prediction Center officials wrote in an update. Unfortunately for sky watchers, the geomagnetic storm appears to be in decline and no further significant space weather is expected at this time." Green auroras, caused by the ionization of atomic oxygen in the atmosphere, are the most common northern lights seen. Red aurora displays are rarer, and are caused by the ionization of molecular oxygen and nitrogen. "I was surprised to find the auroras out so brightly," said Samuel Hartman, a skywatcher in State College, Pa., who sent photos to SPACE.com. "It was originally supposed to be cloudy all night, but the clouds cleared and the aurora was glowing bright. It made for an excellent show." Astrophotographer Jeff Berkes took this photo of a dazzling aurora display from West Chester, Pa., on Oct. 24, 2011. Just outside Philadelphia, in West Chester, Pa., veteran astrophotographer Jeff Berkes also wasn’t expecting an aurora display, especially right after the weekend peak of October's Orionid meteor shower. "I ran outside and jumped in my car leaving the tripod inside. I used the top of my Xterra and a sweatshirt to create a make-shift tripod," Berkes told SPACE.com in an email. "The auroras only last a few minutes. But hey it was awesome! Haven't seen them here since September 2001." Monday night's auroras were seen as far south as Arkansas, where skywatcher and photographer Brian Emfinger caught the view from the city of Ozark. "The auroras filled the sky in every direction - even to the south," Emfinger told the skywatching website Spaceweather.com, adding that it was the website's email alert that warned him of the stunning aurora show. "When I saw the alert, I ran outside and immediately saw red auroras. Within a few minutes the auroras went crazy! Unbelievable!" Skywatcher Tom Pruzenski snapped this view of the Oct. 24, 2011 northern lights display while watching the rare red northern lights with his brother Chris on Oct. 24, 2011 from Hemlock, NY. In Hemlock, N.Y., first-time aurora photographer Tom Pruzenski expressed a similar sentiment. "This outburst of red auroras happened around 9:30 p.m.," Pruzenski said. "My brother (and amateur astronomer) Chris Pruzenski noticed faint auroras two hours earlier, around 7:30 p.m. We waited and watched, and our patience paid off with this 5-10 minute display of red and green auroras." Tom Dolaskie IV watched the northern lights dance over Lake Superior at Munising Bay in Michigan. The view, he said, was astounding and not one he will soon forget. 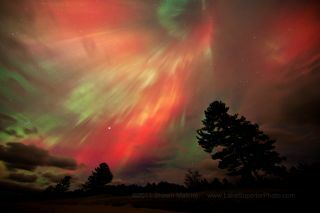 "Hands down the most amazing northern lights display that I have ever witnessed," Dolaskie said. "Frankly, a setting that a photograph simply cannot capture. My friends and I were lucky to have witnessed it." Editor's note: If you snapped a great photo of Monday night's northern lights and would like to share the image and your comments with SPACE.com, please contact managing editor Tariq Malik at tmalik@space.com.